During the past two days the GFS forecasts (above is 168-hour GFS forecast for 00 UTC 2 April 2012) have trended dramatically toward the ECMWF (see previous post). Now the 120-hour forecasts are more similar with the GFS having a large 500 mb cyclone off of western Canada. 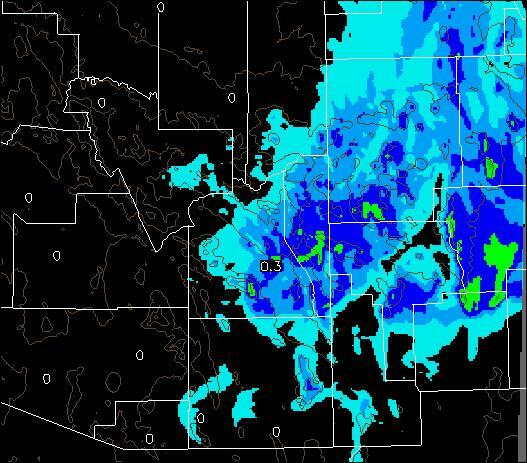 Forecast heights (GFS at 120-hour below) in northwestern Arizona have increased by approximately 300 m! This morning there was a chilly west wind blowing along the Rillito wash, and skies were fairly dirty with suspended dust coming in from the west. 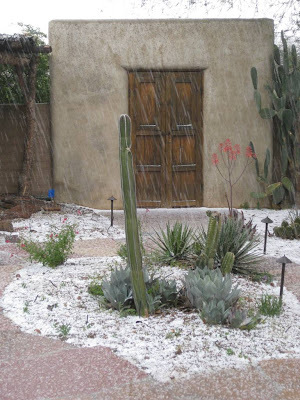 This was particularly noticeable to the east, near the Rincon Mountains and south toward the Santa Rita Mountains. 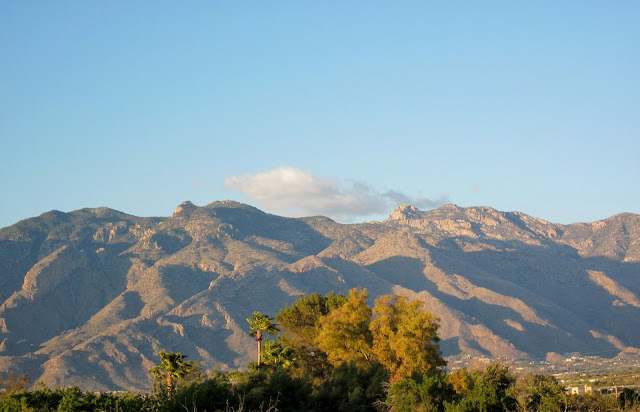 Looks like another dry week here in southeastern Arizona. However, after 6 days the global models seem to head off in opposite, out-of-phase, directions. The ECMWF 168-hour, 500 mb forecast (above) is valid at 00 UTC Monday, April 2nd. The same forecast from the GFS is shown below (both are the operational member forecasts). The forecasts are very different from the central U.S., westward across the eastern Pacific. The GFS forecasts a closed 500 mb low over northwest Arizona with heights below 5400 m. However, the ECMWF forecasts a flat ridge in this area with heights around 5760 m - a difference of more than 350 m! Similar differences (but of opposite sign) are present along the north-central U.S. border and over the Pacific west of Canada. The forecast patterns remain out-of-phase like this for the 6 to 10 day period. Implications for weather conditions, particularly over the western U.S., thus depend upon which, if either, model has a better lock on the long-range synoptic pattern. Above is an interesting graph that I came across the other day. Shows that regardless of local or regional prices in the U.S., gas prices here and in Europe essentially track along similar trends. Prices are of course much higher in Europe (high taxes in Europe keep prices artificially high, or minimal taxes in U.S. keep prices artificially low). More on this later, since the weather is not very exciting in the Southwest, although a Pacific system will kick across the Great Basin tomorrow. The storm that moved across the Southwest rapidly on Sunday and Monday is nearly stuck over the Central Plains. Too bad it got east of here before it slowed so much. Shown above is this morning's forecast (GFS operational) for total precipitation during the coming 7 days, ending Thursday morning, March 29th. New Mexico and much of Arizona remain dry. This week's digging system at 500 mb comes south to off of southern California, but then is quickly kicked out toward the north-northeast. 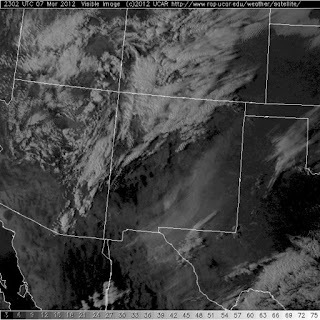 This gives much of California and the Great Basin another significant weather event. 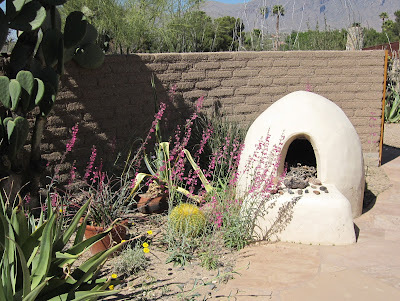 But leaves us in southeastern Arizona with warm and dry southwesterly winds. 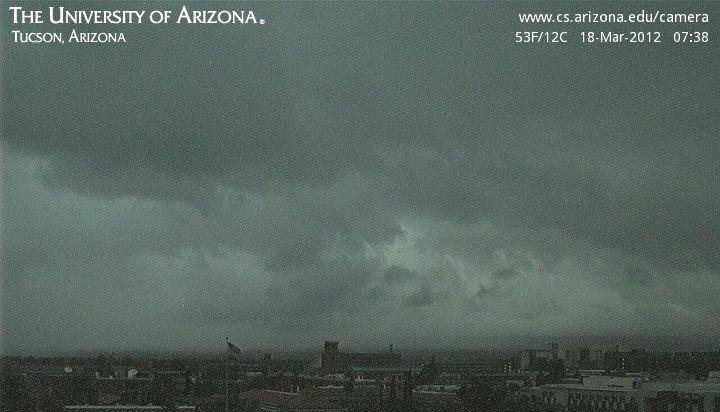 Storm is now far off to the east, and it's a spectacular, albeit quite chilly, evening here in Tucson. Was quite a day yesterday, with more snow in the mountains and afternoon snow across much of the southeastern Borderlands. Here in the Tucson area there was lightning and thunder at times and numerous showers with graupel (erroneously referred to as ice pellets by some who should know better, and as sleet in this morning's Tucson paper). 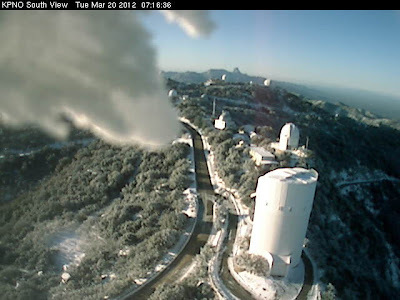 Photo above is from Kitt Peak webcam looking south to Baboquivari Peak (elevation 7,730 ft MSL). Certainly an icy morning out there. Photo below, from a friend of Art Douglas, shows the early afternoon snow south of Sierra Vista. I think there were at least six separate showers here at house with graupel, certainly a record for one day. Additional precipitation during the second round of the storm totaled to 0.22" - giving a two day event of 0.66" here at the house. Frosty morning here with a low of 25F. 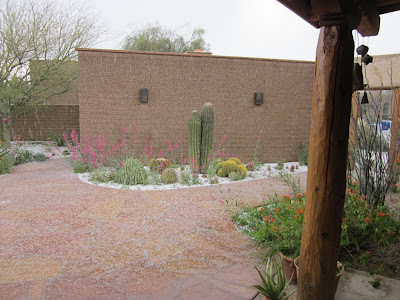 More graupel storm photos from the Ferner's across the circle. 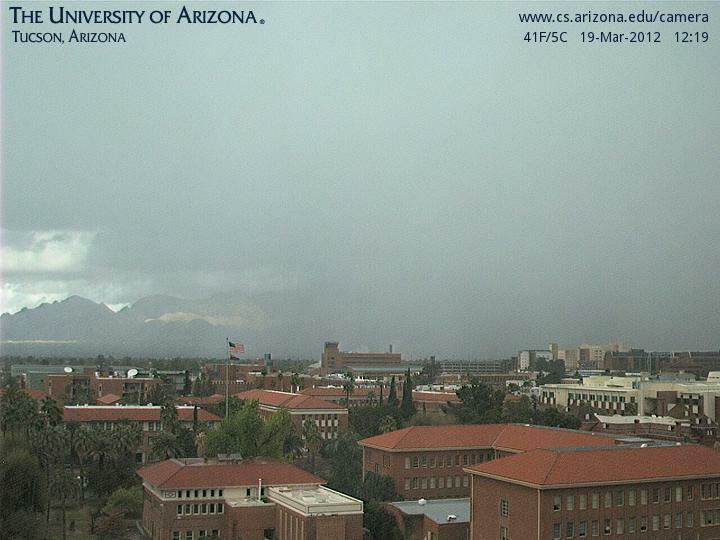 A heavy convective shower of graupel came by a bit after noon (top). 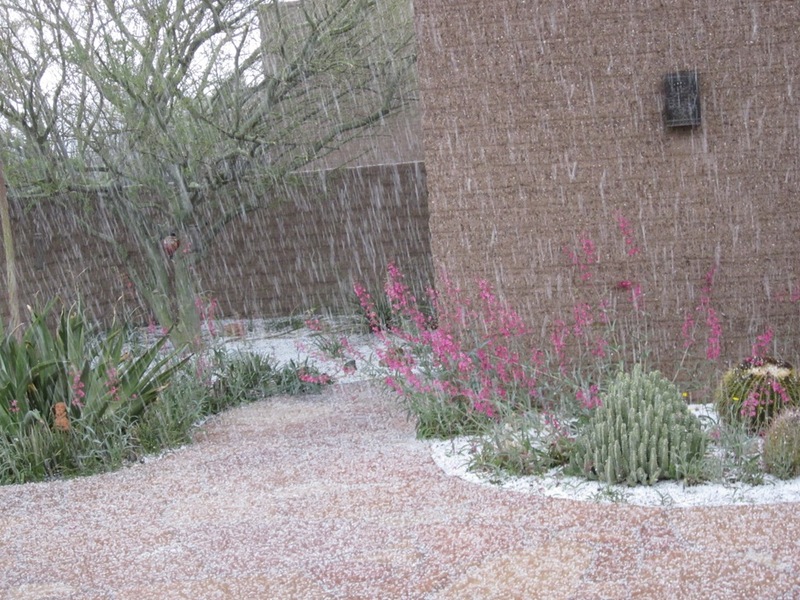 The graupel briefly covered the ground (just above) and during the shower there was a rumble of thunder. The radar image below shows the orange and yellow echo when it was approaching the house (it extends west from the "T" in Tucson). 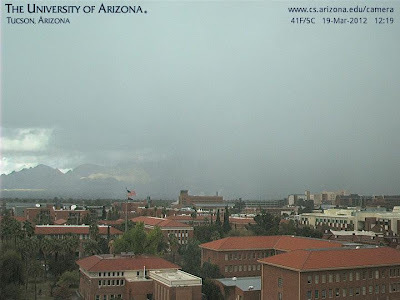 The view from campus at bottom was taken when the shower was nearly overhead (house is located at far right side of image). The ECMWF 168-hour 500 mb forecast valid at 1200 UTC this morning (Monday, March 19th) is shown above. This morning's 500 mb analysis from NCAR is shown below. The general forecast is quite good, although there are many smaller scale details that were not captured in the forecast. Generally, the ECMWF was about 12-hours too slow. The similar GFS forecast was deeper and further west, and was thus about 24-hours too slow. Regardless, excellent forecasts by the global models out at the 7-day time frame. 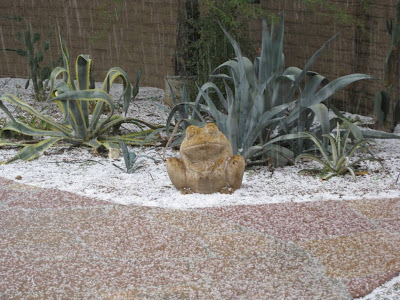 Summary of the weather event so far here in Tucson. During the morning yesterday 100% of the ALERT gauges measured precipitation. At 2 pm MST yesterday 25 of the sites had had over half an inch of rain, with one station measuring 1.02". Here at the house we had 0.44", with the rainfall ending about noon, and only a couple of sprinkles since then. At 6 am this morning only 5 more ALERT stations had reached half an inch, indicating that the bulk of the rainfall occurred with the first band of showers. There was quite a bit of convection during afternoon, with some lightning and thunder at spots. 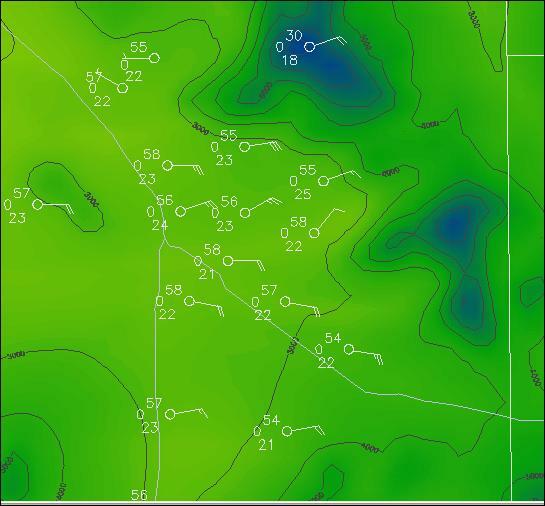 Winds were very strong ahead of the band - highest gust I noticed was 74 mph at the Guthrie RAWS site. Here at the house, this was the most rain in 24-hours since December 13th of last year, i.e., in more than three months. Heavy clouds outside now and another vorticity maximum or two still to come by, so perhaps the event will get a second wind. Low temperature yesterday fell to 38F during the morning rain; the overnight low was 34F - so quite a cold system - again as forecast 7 days ahead by the global models. 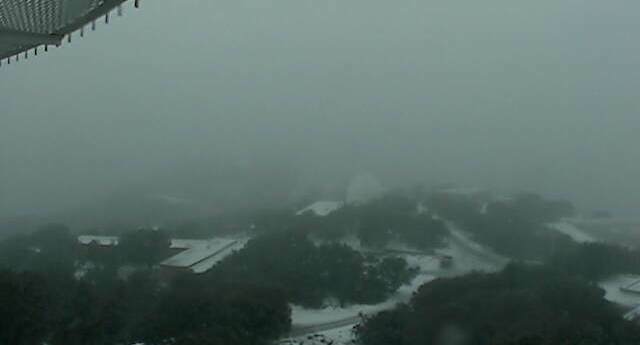 Showers are moving across Tucson area (above view to north of campus at 7:38 am MST), and Kitt peak image around 7 am (below) shows that snow level has dropped below 7,000 ft MSL. The NAM 500 mb analysis for 12 UTC 18 March, 2012, is shown above. Main vorticity maxima at this time is near San Diego, where 500 mb temperature is -31C. Regional radar from NCAR is below for a bit after 7 am. So event has begun - strong winds, rain, and plunging temps outside now. The temperature here at the house was 56F at 6:30 am and I reset the minimum so I can see what the first shower band does wrt temp. The midnight run of Atmo's WRF model forecasts precipitation across all of Arizona as the 500 mb short wave along the California coasts digs further south and moves eastward tomorrow and tomorrow night. Total model forecasted precipitation through 11 pm Monday night is shown above. The accumulated snowfall prediction is shown below. 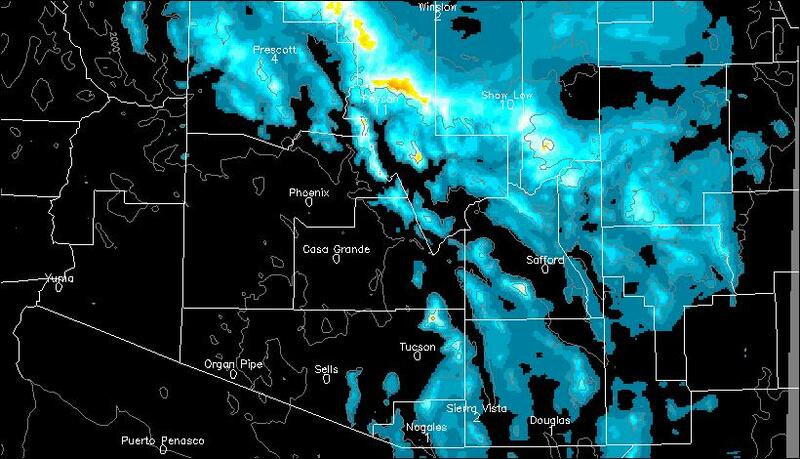 The model forecasts a significant snow event across elevations of southeast Arizona higher than around 4,000 ft MSL. 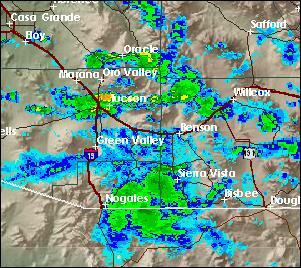 Snow accumulation is indicated along I-10 between Tucson and Benson and over Texas Canyon. Snow accumulation is also forecast along Highway 83, with snow reaching down across the border in several spots. The WRF model forecasts 500 mb temperatures to fall below -30C late Sunday night and Monday morning. Thicknesses during this period fall to 5340 m or lower - indicating that, if snow showers are still occurring, we could even see some flakes here at the house. The long-range, global model forecasts for this event were amazingly good! 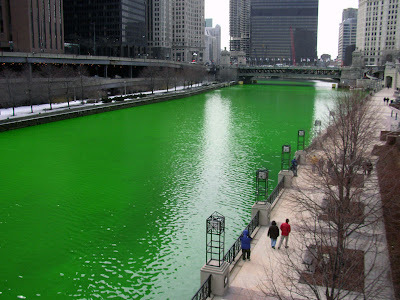 This Spring's unusual warmth has led to a serious algae bloom in the Chicago River yesterday (Friday, March 16th, 2012) - see above. The GFS 72-hour 500 mb forecast valid at 00 UTC 16 March 2012 is shown above from an earlier post. Below is the GFS 500 mb analysis for 00 UTC last evening. Assuming the analysis is realistic, the forecast is playing out quite well. The short wave off the Oregon coast is a bit weaker than forecast; however, the important wave that was forecast into the west Pacific from Asia has indeed materialized. The event appears to be developing a bit faster than was indicated by the 7-day forecast, which led the TUS NWS to forecast 40% POPs for next Monday. Current forecast now maximizes the POPs at 90% for Sunday. A water vapor image for the Pacific is shown below for 1422 UTC this morning. The ridge is building now ahead of the west Pacific short wave and the important (for the Southwest) shortwave is now amplifying east of the building ridge. Quite some performance so far by the global forecast models. 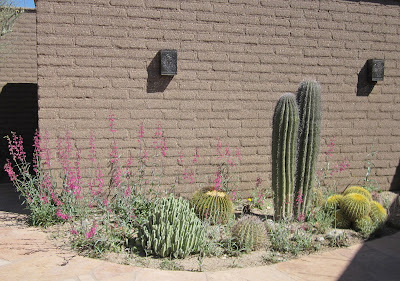 We have a bumper crop of blooming Penstemons in the courtyard right now. 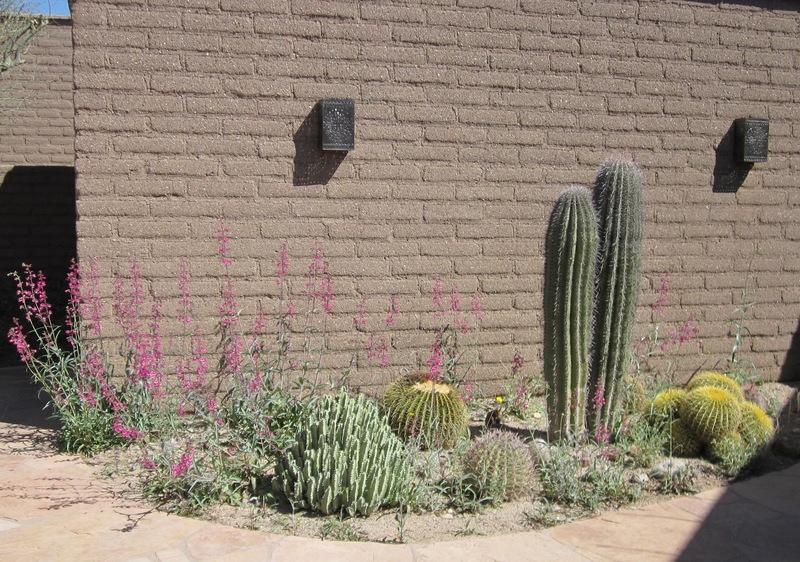 Cottontails are nipping some stalks and eating the blooms. 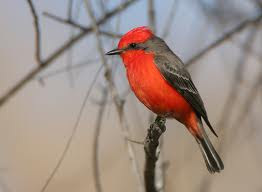 Walks last two days produced sightings of a Vermilion Flycatcher (above) - only the second one I've seen along the Rillito. 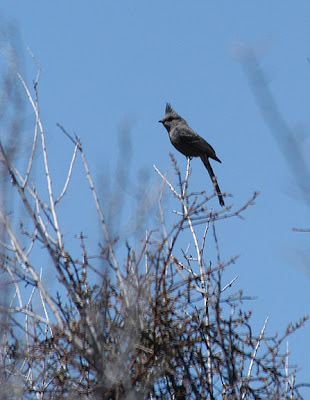 Below is photo of a Phainopepla - there is a small group of them (about 6 or so) wintering along the Rillito area, sometimes as far away as the courtyard. This seems to be quite far north for this mostly subtropical species. They are very distinctive when flying because of bright white slashes on the undersides of their wings. Both birds shown above are males. The new NAM forecasts this morning (Wednesday, 14 March 2012) are similar to the longer range GFS forecasts. 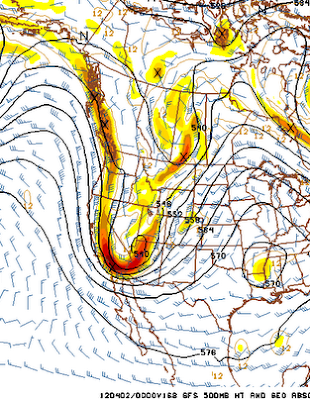 At 84-hours the NAM has a strong, 500 mb short wave digging down the California coast. 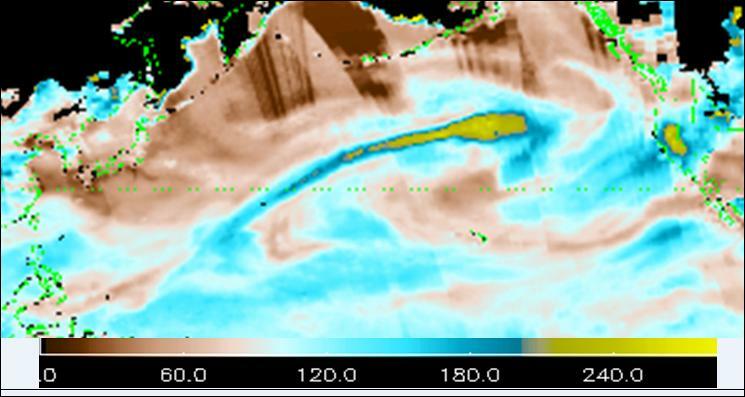 Here are two blended, total precipitable water graphics for the Pacific at 10 UTC this morning (posted to the Map list by Sheldon Kusselson, NOAA NESDIS). The long moisture plume (top) across the central Pacific will play a role in this weekend's forecast Southwest weather event. The broad, southern plume into north-central California is currently associate with a large area of light-to-moderate rain and snow. Below is a graphic that shows the percent of normal values of TPW depicted in top figure. TPW south of Alaska/Aluetians reaches over 240%. This post is a follow-up to the previous post. After the model runs from 00 UTC data last evening, the ECMWF 500 mb forecast for 168 hours was further west and a bit deeper than was the GFS forecast for the same time - a bit of a flip-flop from the previous forecasts. It is interesting that from the time frame of 156 hours to 180 hours essentially all of the GFS ensemble members forecast precipitation over southeast Arizona. The ensemble POPs go something like 80, 100, 80% for these three long-range periods. The TUS NWS has gone a very bullish 40% POPs for TUS on day 7 (Monday the 19th). Other nearby NWS offices have "chance" or "likely" forecasts out for day 5 to 7 (depending on their locations). Chance and likely forecasts translate to POPs from 30 to 70%. I've taken a look at the GFS operational member forecasts for 500 mb across the north Pacific. The 500 mb analysis for 00z last evening is shown below. At this time there was no distinct vorticity maximum clearly present that is forecast to be a player in the long-range. The red maxima over the Aleutians has a long tail to the west and the forecasts indicate that the maximum that will eventually dig down the west coast intensifies along this tail. The 72-hour 500 mb forecast (below - valid at 00 UTC on 16 March) brings a distinct vorticity maximum off the Asian continent to just east of Japan. This shortwave is forecast to kick a ridge northward across the Gulf of Alaska, as it moves eastward. The vorticity maxima just east of the "528" contour label strengthens and begins digging southeastward , partially as a downstream response to the upstream ridging. By 108 hours in the forecast cycle (below - valid at 12 UTC St. Patrick's day), the vorticity maxima of importance for the Southwest is forecast to be just off the central California coast. 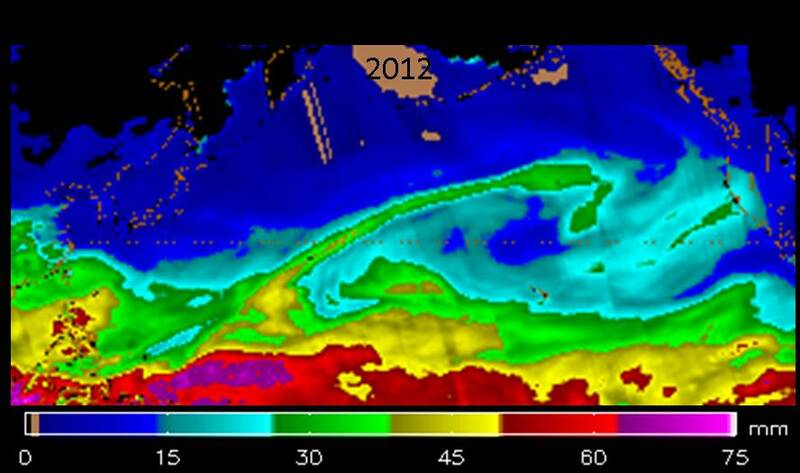 Several very long vorticity streamers are forecast to be feeding into this short-wave trough. I find it quite remarkable that all the various long-range forecast models are picking up on a feature currently over Asia and making somewhat similar forecasts for our Southwest out at 7 days. Will continue to follow this interesting situation. For the first time in quite awhile, both the ECMWF and GFS long-range forecasts are indicating a possibility that precipitation could make an appearance in the far Southwest. It has been almost a month now since a light rain fell here at the house - a month of only cold morning low temperatures, wind, and dust! Above is the ECMWF 500 mb forecast for 168-hours (valid 12 UTC Monday, March 19th) and below is the same forecast from the GFS (both of these are for the operational member). The GFS is actually a bit further west with the axis of the short-wave trough and also just a tad deeper, making this a bit of an unusual situation. Most of the GFS ensemble members forecast some precipitation over southeast Arizona from 168 to 180 hours out. So, finally something to watch. The above graphic is the GFS 500 mb spaghetti chart (20 member ensemble) for 500 mb heights at 168 hours. The southern contours are 5760 m and the northern contours are 5340 m. At this time the model forecasts have a fairly large spread across the western US, meaning that, this far out, there is much uncertainty regarding what might actually happen, particularly in southern Arizona, 7 and 8 days from now. 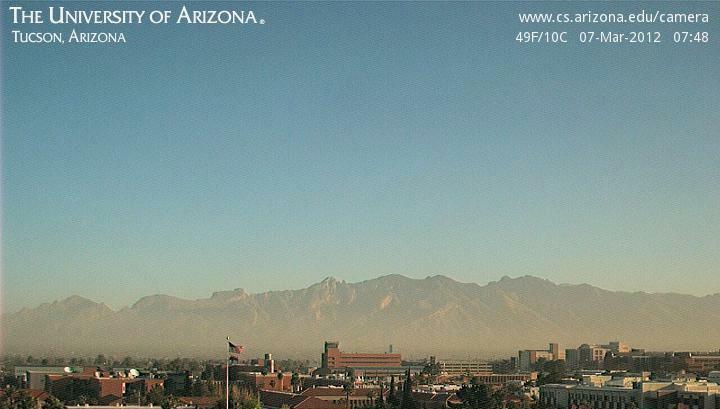 Will we eat more dust or welcome higher humidity - we'll watch closely as the situation evolves. It's very windy at sunrise here at the house with east winds of 30 to 40 mph. The plot above from Atmo rooftop anemometer (not sure why it's broken up a bit) indicates wind gusts over 50 mph. The Atmo early WRF-GFS (below) for 10 am this morning forecasts east winds of 25 to 30 mph - with gusts likely. Winds are being produced by strong low-level pressure gradient as high pressure sinks southward over and east of the Rockies. The 500 mb closed low is wobbling around above southwestern New Mexico and some model solutions bring it a bit toward the west today. 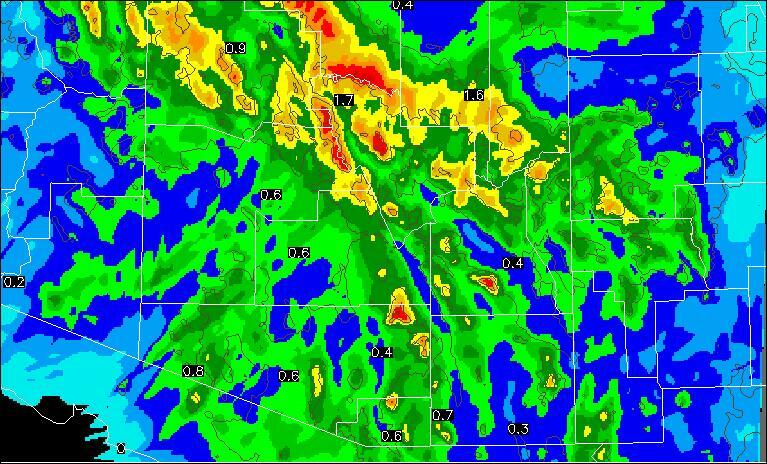 The early WRF-GFS forecasts some precipitation to the northeast of Tucson and over New Mexico through noon tomorrow (see below). The Tucson Festival of Books will occur Saturday and Sunday on campus at the University of Arizona. 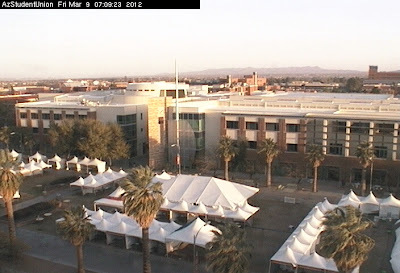 The event tents are all up on the Mall (see image below) and they could be vulnerable to the strong winds this morning! Basically the answer is yes, they are more frequent in the Southwest, but have been for many years. So, I can't comment on whether there is a trend. The figures below are from Bell and Bosart (1989). The figures show that the formation of closed, 500 mb lows is more frequent over the Southwest than over other parts of the continental U.S. for all seasons except summer. Their results are for a study of 15 years, but are similar to other findings for longer periods. I examined several articles, but could not find much in the way of explanations for the observed frequency distributions. If anyone can steer me to a good reference, I'd appreciate it. Two visible satellite views of widespread blowing dust around 23 UTC this afternoon over southeastern New Mexico, parts of Big Bend country, and northeastern Mexico. Winds in this area are currently gusting around 50 to 65 mph. The 500 mb analysis (above) this morning indicates the low to be closed off over the Great Basin with the coldest observed temperature being -30C at Las Vegas. Much cooler the next few days. The morning NAM forecast for 500 mb (60-hour forecast valid 5 pm MST on Friday is below) indicates that the tail of this closed low will still be hanging back over southeastern Arizona as the weekend begins.